This actually doesn’t surprise us at all, but hearing Jared Polis confirm it himself that he will raise our payroll taxes to create yet another government-run system to magically fix our government-run broken health care system is always helpful. 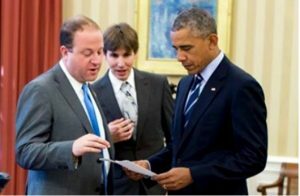 REVEALED: Congressman Polis will raise taxes on hardworking Coloradans to pay for his government takeover of your health care. Just listen to his own explanation. But first, Polis will have to wave his magic wand to get around TABOR and raise our taxes. And, didn’t we just vote this kind of health care crap down by overwhelming numbers just a couple of years ago? Listen for yourself and decide if forking over more money out of your paycheck will help you afford healthcare.